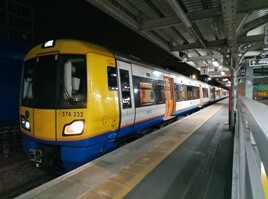 The plan for Transport for London’s introduction of electric trains on the Gospel Oak-Barking line remains unclear, with two of the Class 172 diesel multiple units currently used on the route already taken off-lease from its operator Arriva Rail London for transfer to West Midlands Trains. TfL then said at the unveiling of a Class 710 at Willesden in June last year that they would enter traffic in autumn, but that deadline was missed. The last date given was mid-December. A four-car Class 378 electric multiple unit (reduced in length from five coaches owing to platform length limitations) has now been tested on the line as a stop-gap measure to cover for the delayed introduction of the Class 710s planned for the route, seven of which are at Willesden undergoing testing (710261-263/265-267/269). A decision on whether to introduce the Class 378s was due to be made in the week beginning January 14. For the FULL story, read RAIL 870, published on January 16, and available digitally on Android, iPad and Kindle NOW.